not even oriundo- calcio without citizenship: What Now, Mr. Li? 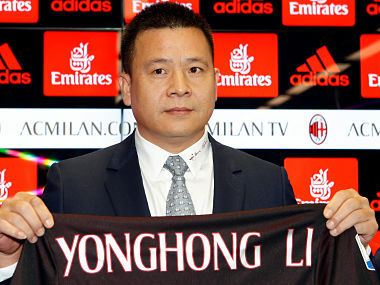 Milan president Yonghong Li keeps his own counsel. After a year, it's still difficult to understand who he really is. A prestanome, or figurehead, for a group of investors, the Italian media and Milan fans sometimes speculate. But almost always, the guesses get more and more bizarre from there. Perhaps he has a fortune tucked away under a mattress. Perhaps it is his wife who is really wealthy. Perhaps he is backed by the General Secretary of the Communist Party of China, the well coiffured Xi Jinping himself, but because of the way the Chinese work, he can't come out in the open. Perhaps he is just washing Silvio Berlusconi's dirty money. "Riciclaggio (money-laundering)! Complotto (conspiracy)!" the ones who love a good conspiracy (and there are a lot) scream. "Testa di legno (blockhead)!" scream others, others who reckon that Li is a poor schmuck, out to make a buck, in over his head, and probably scared. Some time in the last year, to spice things up, the New York Times published an article about how the offices registered under Li's name in China are teeming with...nothing. Well, spare a trashcan festering with maggots. Li, in other words, is a no one. A cipher. Every prominent Italian with some links to China has said they have never heard of him. Former Italy coach and current manager of the Chinese national team, Marcello Lippi, says, nope, never heard of him. Former Milan and current Jiangsu Suning coach, Fabio Capello? Yeah, no idea. I'm paraphrasing, but you get the point. Li sometimes shows up in Italy wearing a hideous lime green blazer (surely, a cardinal sin in Milan, no? ), struts through Milanello with his children and wife, and then leaves. He sometimes simpers next to CEO Marco Fassone. Once he wished Milan fans a Happy Chinese New Year over skype from a dimly lit room, sitting in front of a giant wall-unit. The video was bleak, when it was meant to be reassuring. The kind of video captors force captives to do. If so, I guess it worked. It confirmed for me that Li was alive--which is more than I could say about Milan at the time. It has been fourteen months since upon becoming president Li delivered a prepared statement in Mandarin at Casa Milan. He read from a card. Tired. Jetlagged. A far cry from the Berlusconi helicopter landing. Then came Franck Kessie. Leonardo Bonucci! An obscene Gianluigi Donnarumma contract renewal. Fans cut him some slack. It was a joyous time. So what if he had relied on a massive loan from the vulture fund, Elliott, to buy Milan? The president, whoever he was, was maintaining his promises and commitments. Li ha sempre mantenuto i suoi impegni (Li has always honoured all his commitments), the fans wrote online on forums. And wrote. And wrote. Every capital increase was a benediction for his supporters. "He is rich," some said. "That's why he keeps paying." "He has rich backers, and that's why he keeps paying," said others. Milanisti in the twittersphere became overnight accountants. Spreadsheets appeared on prominent accounts. People quibbled over numbers, gaining an education in finance under the auspices of their president--absent, taciturn, but real, and worthy of respect. The media, meanwhile, continued its inquiries. Li's secrecy supplied them with ample material. The conclusion was almost always the same: Suning, Inter's owners, were real; Li was a fraud. He would lose the club to Elliott unless he found backers. The more charitable quarters of the Italian media still wanted to give him the benefit of the doubt. But now, Li has squandered even the faintest trace of goodwill. Last week, the president didn't make the last 32 million euros capital increase required of him, and Elliott did. If Li doesn't pay them back in ten days, he loses the club. Meanwhile, UEFA, not taken with Li or his methods or Fassone's doubtlessly passionate powerpoint presentations about how Milan's accounts are better, much better, from last year, rejected the club's settlement agreement. All of this leaves Milan teetering on the brink of uncertainty, and, possibly, irrelevance--even dissolution. Too much? Perhaps. UEFA's punishment is rumoured to be severe. A two-year exclusion from Europe. At best, one. Which player would want to stay? Which player would want to come? If Milan do end up with Elliott, what will stop the vulture fund from doing whatever it takes to get their money back? Some have said, no, they will put Milan up for auction. Then what? There could be serious buyers, sure, but that is an uncertainty. There is hope, however, and it comes from the USA (typical--you can almost see the cocksure suits surveying the carnage, dead confident they can salvage something). The owners of the Chicago Cubs, the Ricketts family, released a statement on Friday saying they were interested in purchasing Milan. They wanted to build something with a city and its fans. They would be in it for the long haul. Li's right-hand man Han Li was in New York negotiating. But then media said, no, a Mr. X, a man with 4 billion dollars to his name, was ahead and about to close the deal to buy Milan. This man was being pushed by Goldman Sachs. The Ricketts by Morgan Stanley. Suddenly, Milan fans whitewashed American finance. Goldman Sachs? Morgan Stanley? All part of a legitimate lexicon. The 4-billion dollar man was Rocco Commisso. He wanted Milan, and he wanted it all. Li now finds himself with three options: 1) somehow pay back Elliott the 32 million for the latest capital increase and drag everything to October 2) do nothing and lose the club to Elliott 3) accept an offer where he will either have a minority share or no share at all. Milan fans wait for that and the UEFA sentence. Milan being out for 2 years would be catastrophic for the club. One can be tempted to compare the situation to Juventus's after Calciopoli. For sporting irregularity, substitute financial weirdness. Juventus's descent into Serie B was purgatorial, and so could a European ban prove for Milan. But the context is entirely different. The gap between Juventus and other Serie A clubs is now enormous. Juventus's stadium is part of it, but a part that is exaggerated, in my view. The real reason behind Juventus's dominance, financial and on the field, is that they're backed by the Agnelli family, a family that is invested in their success, and since 2012 a family that has ensured that no one gets a look-in. Dibs on players. Deep runs in the Champions League. Earning obscene amounts from those deep runs. Selling players at a huge profit and replacing them with quality ones. Coach Massimiliano Allegri. Success begets success. It will be colossally difficult for Milan to regain ground. These are dark, dark times. Maybe, maybe, if Li accepts an offer quickly, Milan can hope for some clemency from UEFA. I am at once relieved and angry. On the one hand, I can understand UEFA's decision, and, thankfully, it has forced Li into action (behind the scenes, of course). On the other, I do think UEFA is punishing Milan so harshly because they can. Milan have no clout. Milan is only nominally a big club, currently. Punishing it makes all the sense in the world for UEFA. In the meantime, the system will become even more stratified. The upper-class of Europe will enjoy the Neymars and Ronaldos of the world, and continue to vie for continental trophies. Milan's stupendous transfer market, a heavily leveraged buyout, and an outstanding debt are things UEFA can't and won't ignore. Fassone can try to separate Li's debt from Milan's but they are linked. Milan's fortunes are linked to Li. A man whom we still know almost nothing about.